At the turn of the nineteenth century, Montana exploited the richest copper deposits in the world, fueling the electric growth of twentieth-century America and building some of the nation’s most outlandish fortunes. The toxic byproduct of those fortunes-what didn’t spill into the river-was dumped in Opportunity. In the twenty-first century, Montana’s draw is no longer metal, but landscape: the blue-ribbon trout streams and unspoiled wilderness of the nation’s “last best place.” To match reality to the myth, affluent exurbanites and well-meaning environmentalists are trying to restore the Clark Fork River to its “natural state.” In the process, millions of tons of toxic soils are being removed and dumped-once again-in Opportunity. As Tyer investigates Opportunity’s history, he wrestles with questions of environmental justice and the ethics of burdening one community with an entire region’s waste. Stalled at the intersection of a fading extractive economy and a fledgling restoration boom, Opportunity’s story is a secret history of the American Dream, and a key to understanding the country’s-and increasingly the globe’s-demand for modern convenience. As Tyer explores the degradations of the landscape, he also probes the parallel emotional geography of familial estrangement. 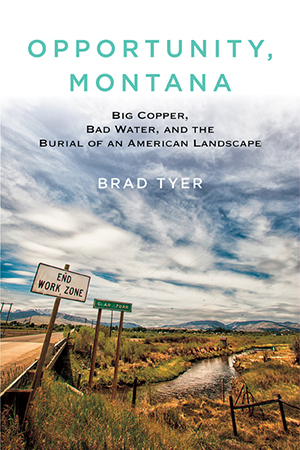 Part personal history and part reportorial narrative, Opportunity, Montana is a story of progress and its price, of copper and water, of father and son, and of our attempts to redeem the mistakes of the past. "Tyer blends nature writing and memoir, focused on his estrangement from a perfectionist father, with cultural history and journalistic reporting, including interviews with a variety of local players. The mix can seem a bit unwieldy. But the result is an engaging, almost breathtaking bit of nonfiction." "Tyer's evocative prose of quiet melancholy and gentle humor." "An intelligent, insightful, and finely crafted book that channels outrage into clear thinking." "Memoir, history, and the unequal application of economic justice come together in Tyer's deeply felt and sharply penned nonfiction debut."